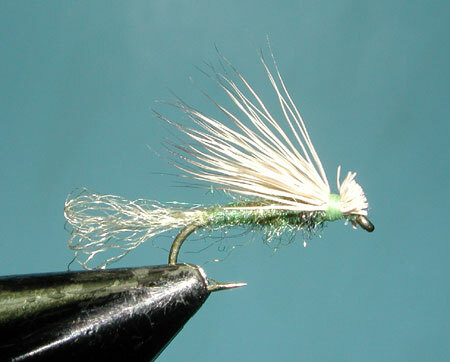 Notes: This caddis imitation was originated by Craig Matthews and John Juracek of West Yellowstone, Montana around 1980. Originally, it was tied with beaver dubbing for the body but presently Antron is used most often. 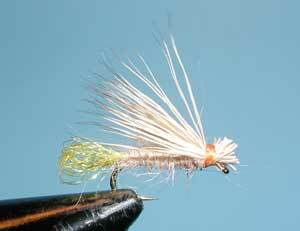 The fly resembles a caddis that has a trailing shuck and when fished in the surface film is deadly. 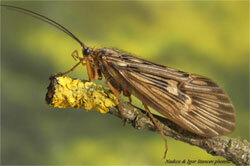 Caddis shucks are nearly transparent so it is important not to provide to much material to this part of the fly. Sierran flyfishermen Ralph Cutter, George Bouvoin, and Jan Kurahara, changed the Matthews' shuck by looping the zelon back on itself, this created a more natural bubble-like appearance. Color of wing and body should be adjusted to match the hatch. The olive colors generally are used for the gray sedges and grannoms, tan colors are used for Hydropsyche species, and black is used for small grannoms and brachycentridae. The fly is fished with an upstream presentation using a drag-free drift. If necessary, floatant will be applied to the wings to keep the fly within the surface film. 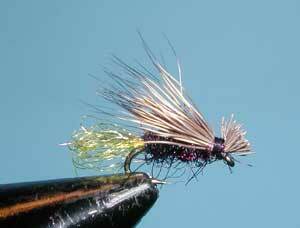 The important feature is to allow the body of the fly to float low within the film as an emerging caddis.